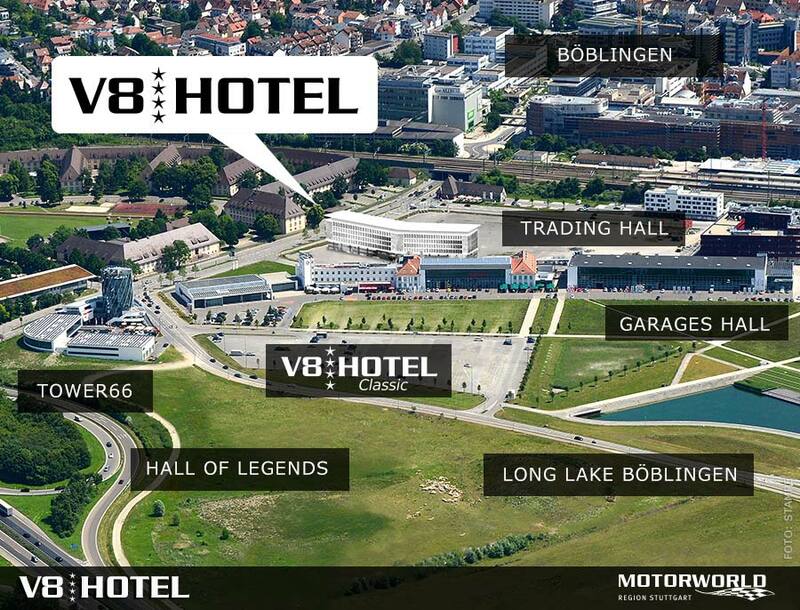 The V8 Hotel classic has a large brother: the new V8 HOTEL - from January 2018 with a total of 153 design and themed rooms, apartments, meeting rooms, restaurant and bar. 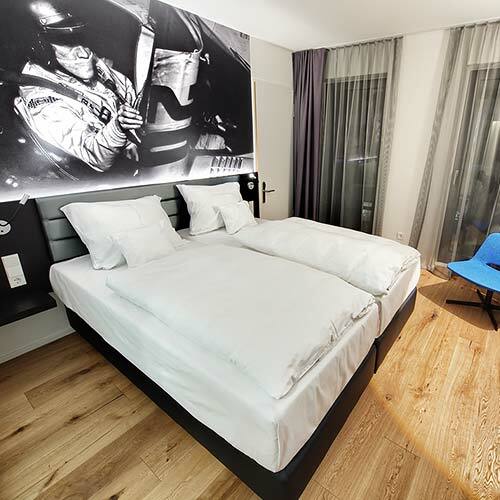 With its modern, clear architecture, the new V8 HOTEL is perfectly integrated into the MOTORWORLD ensemble. On approximately 6,000 square feet, it is made for lovers who want to experience day-by-night and night-time passion. On the ground floor, where the lobby, the restaurant for breakfast and evening, the hotel bar and sales areas for high-quality vintage cars and high-end sports cars are located, automobile treasures are placed in the foreground. From there, the light-flooded atrium opens the view to the top floor. Our conference area on the first floor of the open atrium also offers plenty of space for a get-together and breaks between the three meeting rooms that can be combined. On the sixth floor is the fitness and wellness area. Our 130 wooden-floored V6 double rooms on the second to fifth floors are decorated with real wood parquet and wall graphics with great photographs from the automotive scene create a special atmosphere. The 16 V8-themed rooms are located on both ends of the building. They are accustomed to loving care and attention to detail. 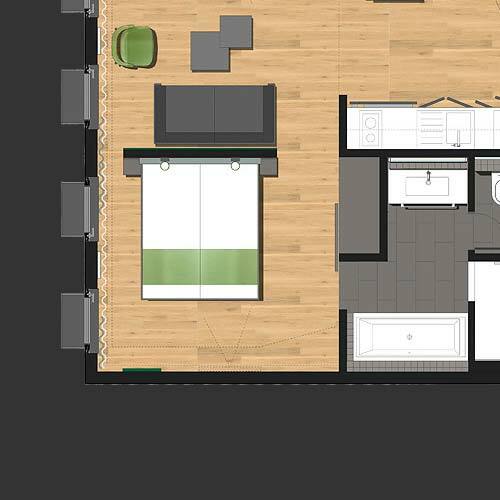 Our seven spacious 46qm V10 service apartments on the first floor with high-quality equipment and terrace access are offered for a long-term stay, as a family room or simply with a need for a lot of space. Our hotel bar and the restaurant PICK-UP are unpretentiously stylish in combination of modern architecture and retrolook. The kitchen spoils our guests with regional dishes, which are freshly prepared with local products depending on the season. Fitness and wellness can be found on the top floor with a view of the Motorworld.All sports equipment are placed on the wide window front with a view over the roofs.Leave the view from the Panoramasauna towards the sunset and the cool down on the terrace. 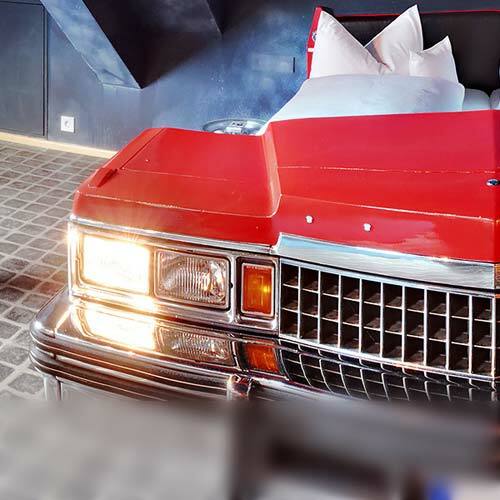 The newly reconstructed Charles-Lindbergh-Place in the course of the construction measures creates an optical and spatial connection between the existing V8 Hotel Classic, the legendary event hall and the NEW V8 HOTEL. The V8 Hotel offers the best conditions for meetings and events, as the adjacent Motorworld, with its numerous meeting rooms, catering establishments and event areas, provides additional capacities and opens up almost all possibilities. Here you can see impressions of the construction phase from the groundbreaking to the final spurt.